A traditional choir leading the carol singing is a big part of Christmas, which wouldn’t be the same without classics such as Silent Night, Hark the Herald Angels Sing, God Rest You Merry Gentlemen and many more. The tradition of singing special Christmas songs dates back many hundreds of years. Even in ancient Rome, before the birth of Christianity, people held a winter festival called the Saturnalia, when there was singing and dancing to brighten up what was otherwise a cold and bleak time of the year. After the birth of Jesus Christ and the spread of his teachings to many parts of the world, his followers wanted everyone to know about the wondrous event. They began to put Christian lyrics to the favourite old songs of the time. They didn’t become known as “carols” until around the mid-12th century, when the French used the word “carole” to describe a popular new dance, accompanied by singing, when everyone stood in a circle. By the late Middle Ages, the singing of carols had become specifically associated with the nativity and Christmas celebrations. Many of the carols that we know and love today were written by the church leaders in the 19th century. People traditionally sang carols in their own homes, while professional choirs in the churches sang more sophisticated Christmas music and led the singing at the services. One of the most renowned and accomplished choirs today is the Westminster Abbey Choir. It comprises boys aged eight to 13 years. There’s even a special school, the Westminster Abbey Choir School, where the young choristers receive their formal education. It’s the only choir-based school in England and has 36 students, who are either full-time choir members or studying ready to join the choir. Auditions are held when the boys are eight years old. The choir is traditionally made up of boys because experts say boys and girls each have distinctive voices and only those boys with the purest tones are chosen for Westminster Abbey Choir. The subject of why choirboys have such beautiful, pure voices is such a source of fascination that scientific research has been carried out into why this is the case. It’s all down to the vibrations caused by the folds within the larynx when a person sings. This is why, as the boys get older, their voices will begin to change, as their larynx grows wider as they approach adolescence. Boys whose soprano voices can soar to unbelievable heights, including amazing soloists whose voices peak above those of the rest of the choir, are chosen for one of the world’s most prestigious church choirs. The youngsters sing at Evensong at the abbey six days a week and also lead the hymns at three Sunday services. When the boys reach the age of 14, they must leave the choir, due to their voices breaking. Some of the former choristers became lay vicars, while others have gone on to achieve musical careers outside the church. These have included the world-famous English composer Orlando Gibbons, who was a choirboy in the late 16th century, before composing some of the most famous songs of the 17th century as an adult. His fellow English composer, Henry Purcell, was also a former Westminster Abbey choirboy, before going on to write his unique style of Baroque music in the 17th century. As well as singing at special events and occasions at Westminster Abbey, the choir also undertakes international tours. In recent years, they have travelled to the United States and Moscow to perform concerts. They have also made records of their singing. The Westminster Abbey Choir was founded in the 15th century. It might even have been earlier, as the abbey was founded by Edward the Confessor, who was consecrated on 28th December 1065, but the earliest formal records of a choir date from 1479, when it was noted that William Cornyshe was appointed choir-master. The annual Christmas carol service at Westminster Abbey is a breathtaking occasion which attracts people from far and wide. Popular carols, such as Oh Little Town of Bethlehem, Silent Night, Carol of the Bells, We Three Kings and many more are sung by the choir of Westminster Abbey. This years’ service will take place on Thursday 13th December from 7pm, when harpist Lucy Wakeford will be joining Westminster Abbey Choir for a feast of traditional music. They will be accompanied by organist Peter Holder and conducted by James O’Donnell. Composer Benjamin Britten’s magical Ceremony of Carols, a choral piece consisting of 11 movements, written in 1942, will be the centrepiece of the Christmas concert. There will also be a selection of well-known festive choral works, traditional carols for everyone to sing and seasonal readings. The doors open at 6.15pm and the performance will end at around 8.15pm. 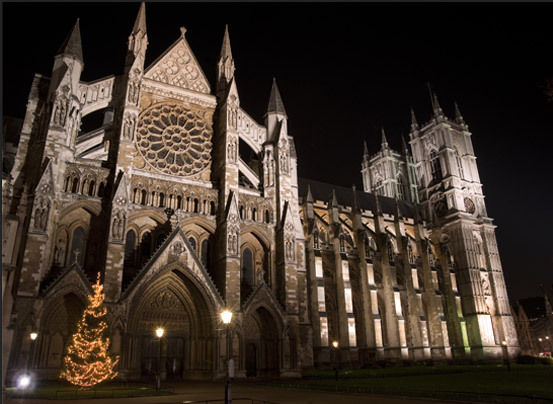 If you’re planning to visit beautiful Westminster Abbey to enjoy the Christmas concert, travelling by minibus from H&H Van Hire is ideal for groups of people. Divide the hire fee between the party members for a convenient and cost-effective solution to your Christmas travelling needs. Please contact us for further details of our comfortable nine, 14 and 17-seater minibuses this Christmas.